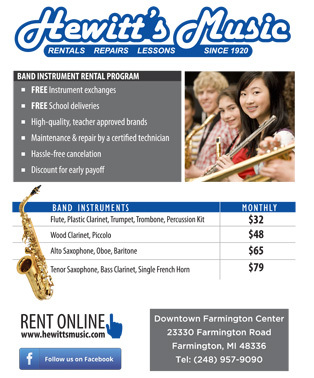 "I would like to thank the staff at Hewitt's Music for providing my student with forty two years of remarkable service. I can trust Hewitt's Music to support Music Programs in public schools, while maintaining high professional ethics." "When I began teaching instrumental music in the district in 1995, I used three companies to service my musical needs. After working with Tim Hewitt, I quickly determined that I could obtain all my needs through Hewitt Music. I am very lucky to have Tim Hewitt assigned to Davis Junior High School as our sales/service representative and would highly recommend Tim to any school district." "On behalf of The Henry Ford, thank you for your generous in-kind gift of 2 – 1960 replicas Stradivarius violins for Market Faire hands on activities. Yours was a wonderful gift to The Henry Ford. Thank you for your generosity." "On behalf of our Central Middle School family, I extend my sincerest appreciation for the exceptional service you have provided for our students. Your generosity in extending loaner instruments to students with extenuating circumstances is so greatly appreciated. Thank you for being a partner in our education of students." 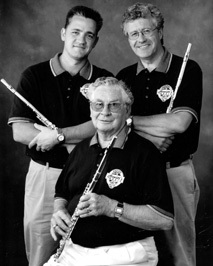 "The owners of Hewitt's Music are wonderful people that truly care about children learning music"
Hewitt's Musical Instrument Company was originally founded by Clarence E. Hewitt Sr. in 1920. The first store was located on Clairmont Avenue in Detroit, MI. To this day Hewitt's has remained dedicated to serving the needs of the students who are serious about their musical pursuits. With four generations of experience, Hewitt's offers a wide range of services your family can trust and depend on. Clarence E. Hewitt Jr., graduated from Cass Tech High School and University of Detroit. After serving four years in the United States Navy, he spent 20 years as band director in the Dearborn Public Schools. Clarence performed in the professional field with the Detroit Symphony Orchestra at the Fisher Theatre and with name acts such as Judy Garland, Frank Sinatra and many Motown artists. He also played saxophone on the Detroit based Soupy Sales Show in the 1950's. Tim Hewitt is the third generation owner and also understands the professional aspect of what it takes to run a music program and to work as a band leader. Tim studied music at Interlochen Arts Academy and continued his studies in music at North Texas State while playing his clarinet, saxophone and flute. 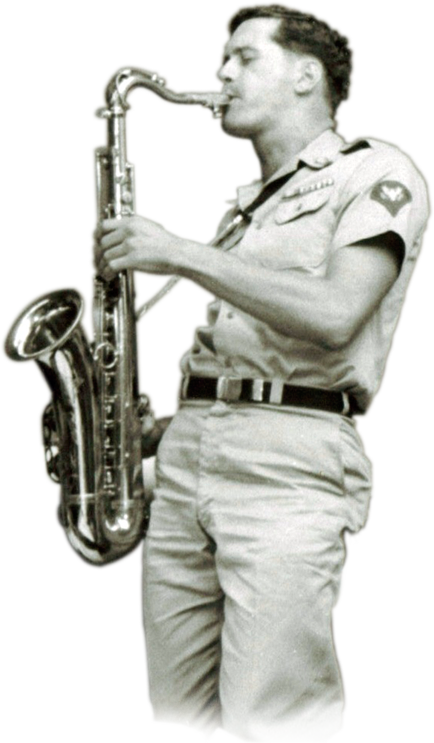 Tim was a member of the United States Army band during the Vietnam War and is the founder of the Tim Hewitt Group. He has also played professionally with Doc Severinson, Chuck Berry, Aretha Franklin and Stevie Wonder. Tim recently performed saxophone in the studio on song tracks for Detroit's own Eminem and Jay-Z. Philip Hewitt is the fourth generation owner and current President of Hewitt's Music. In 1996, after serving seven years in the United States Air Force, Phil returned home to join the family business. Today, Phil specializes in all aspects of school service with more than 19 years of experience in account management, vendor procurement, retail sales and operations. Hewitt's Music will be celebrating its 100th Year Anniversary in 2020. We are proud to me one of the oldest family owned and operated music companies in the country.